Coping skills freeze tag is great for people to identify coping skills that they can use and when they can use them. Peers listening to each other's coping skills can also help give new ideas. Designate one player as 'it' with the other players scattered throughout the playing area. The person who is it tags the other players. When a player is tagged, (s)he freezes. To be unfrozen, the player has to name a coping skill and be unfrozen by getting a high-5 from another peer who is not frozen. I like to make a rule that people cannot repeat coping skills so that they have to think of more. With younger groups, you may need to talk about what coping skills are beforehand and have older kids give examples so everyone understands. What are things you would discuss with this game? What are some other ways that you like to play tag? At our facility this year, we are not allowed to use plastic eggs for the Easter egg hunt so we got a creative and made origami Easter eggs with the patients for group! We will hide these Easter morning and have an Easter egg hunt!!! Have the patients pick a partner and sit at a table next to each other. Tell everyone to raise the hand they write with and then put it behind their backs. Give them the instruction page on this blog. During this activity, they can only use their non-dominant hand and work with their partner. Each partnership will make 10 origami eggs. *Watch the patients closely, if they are anything like the patients at my facility they will try to switch hands or use both. *This activity spurred a long discussion. Many of the patients tried to cheat, some became frustrated and yelled at their partner, and one partnership worked really well together. How would you wrap this activity up with a group? What other Easter crafts do you do with your patients? Tell the patients that they are going to make an Easter Banner to decorate their unit. Give them the supplies and have them talk about how they are going to decorate it. Let the patients drive this activity and just watch for anything inappropriate. All of my groups loved this! Teamwork: what did they do to work together? Did a leader come out among them? Communication: where there any problems with communication? How did they clear these up? Expressing self with others: how can we express ourselves but still be part of a team? What are other ways that you would do this activity? How would you discuss this activity? What other Easter activities have you done with patients? Give each patient a brown bag and three pieces of construction paper (I let them choose their colors). Two of the pieces of paper will be used to cut out the eyes, ears, feet, nose, teeth, and whiskers for the bunny. These will be glued on the front side of the bag (where the flap folds over-put the face on the flap). One piece of paper will be balled and glued on the back side of the bag to be the tail. 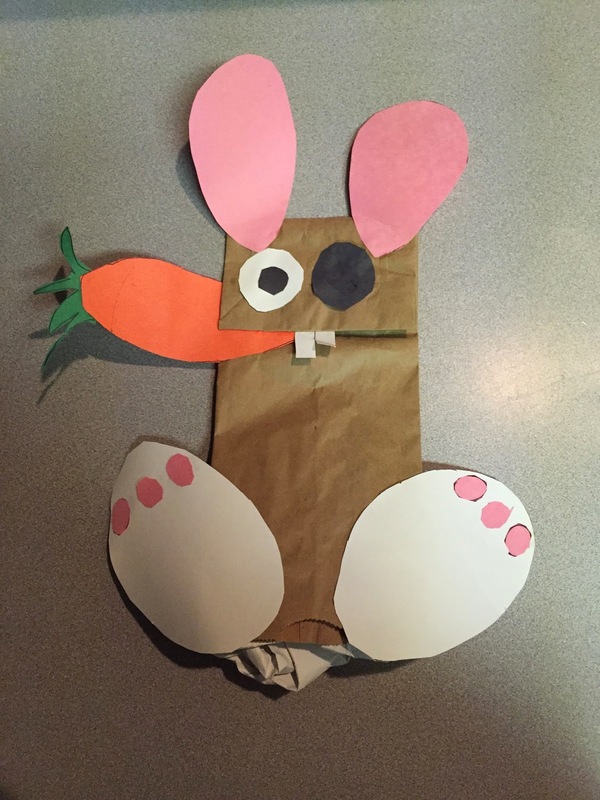 If you have more paper, they can make a carrot and put it in the bunny's mouth. Problem solving: give the patients the materials and tell them what the end product needs to be but do not give the middle instructions. Importance of Rules: give the patients step-by-step instructions and talk about the importance of rules. This is such a fun and beautiful holiday! I love celebrating the Resurrection of our Lord and Savior, Jesus Christ. At my work, we do not celebrate religious holidays though so we focused more on secular celebrating of Easter. We made Easter bags! Each patient received a paint brush, plate, and brown bag. To start with, I filled each person's plate with three colors of their choosing. Patients could request more paint after everyone had received paint. Then the patients began painting. 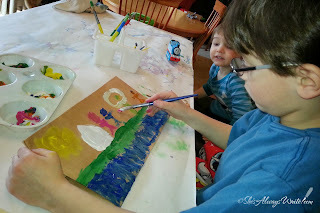 The only direction I gave them for painting was that these were their Easter bags. One patient made a beautiful picture of the cross on the hill, another painted "Happy Easter", more psychotic patients just did scribbles of paint, etc. The children, adolescents, and adults all enjoyed this activity. Family rituals: we talked about the different rituals each patient had with this holiday and how family rituals are so important to keep members of the family close. Self-expression: expressing ourselves on our regular basis and the benefits thereof. Relaxation: the importance of participating in relaxing activities and activities that relax us. After the group, I collected the bags and stuffed them with candy and different activity pages. The patients will receive their bags Easter morning! What activities have you done to celebrate Easter? What activity pages have you used? First, ask your group who can demonstrate juggling (There is usually at least one person who can juggle). Ask, “Who can juggle the most balls?” Two or three balls are usually the limit. Now have everyone (usually best with 8-12 people) stand in a circle about arm’s length apart. Ask the participants to throw the ball to someone in the circle that is not standing next to them. each person catches the ball only once except it must start and end with the same person. tell them you are creating a pattern; they need to remember to whom they threw the ball and who threw it to them. After the ball has made it around the group once, send in more balls until there are two less than the number of people in the group, or until they start dropping a lot. Try it two or three times. Ask them to be more efficient each time. How much more can a group accomplish than an individual? What happens to the process when one person drops a ball? How does the group compensate? What does it take for a team to be successful? Use stuffed animals instead of ball and use the story of Noah’s Arc and tell them water is coming in and we must juggle the animals to keep them from falling in the water. Put the rope on the ground. 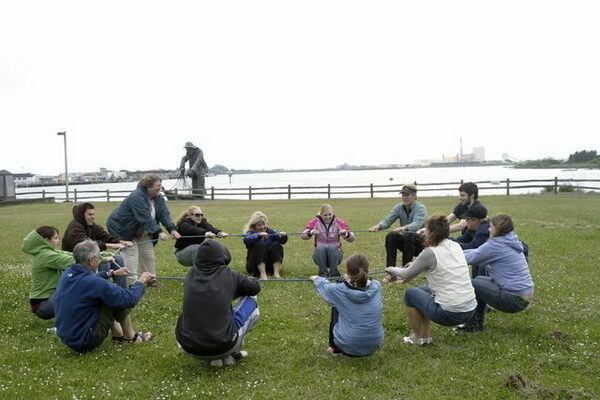 Have the participants grab the rope and pick it up to waist level. (You can have the rope tangled and tell them to untangle it at this point if you want to make it more challenging). Tell the participants to walk back until the rope is tight and to spread out evenly on the rope. Now, they are to sit down together as a team without ever moving their feet. What variations have you seen done with this activity? How would you discuss this with your group?